While we did spend most of January showcasing some of the top design trends that are expected to rule the year ahead, accent walls are a perpetual favorite! With contemporary themes and neutral color schemes taking over most interiors, it is only apt that accent walls find greater prominence in the interior design universe. 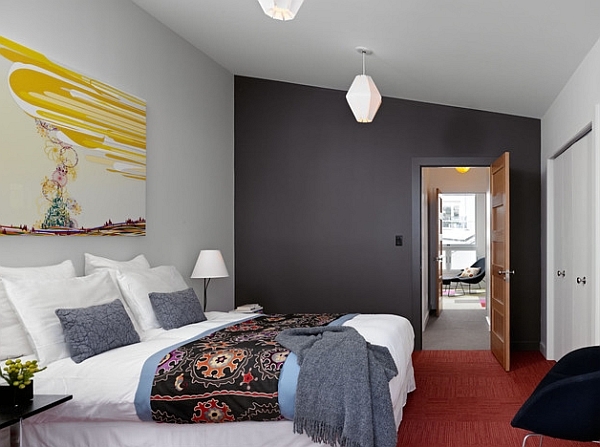 And it is the bedroom that’s often the starting point for most of our experiments with the vivacious accent wall. The privacy of your bedroom offers you a freedom in trying out unabashed hues, patterns and styles that you might otherwise shy away from. 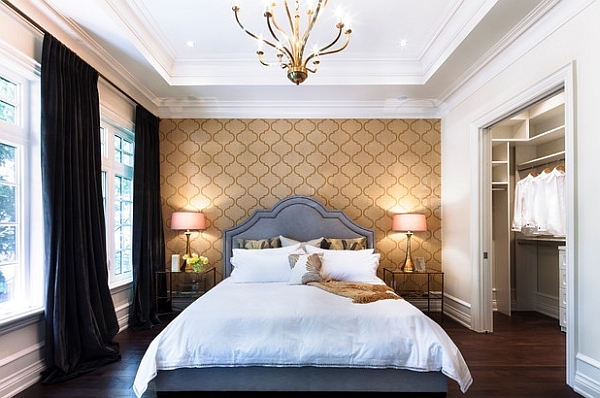 Today we take a look at some fabulous bedrooms that offer ample inspiration when it comes to choosing the right accent wall for your own home. Since featuring every single color is a touch monotonous, we have showcased several different available themes and options so that you can be inspired to create an accent wall that goes beyond just offering color contrast! 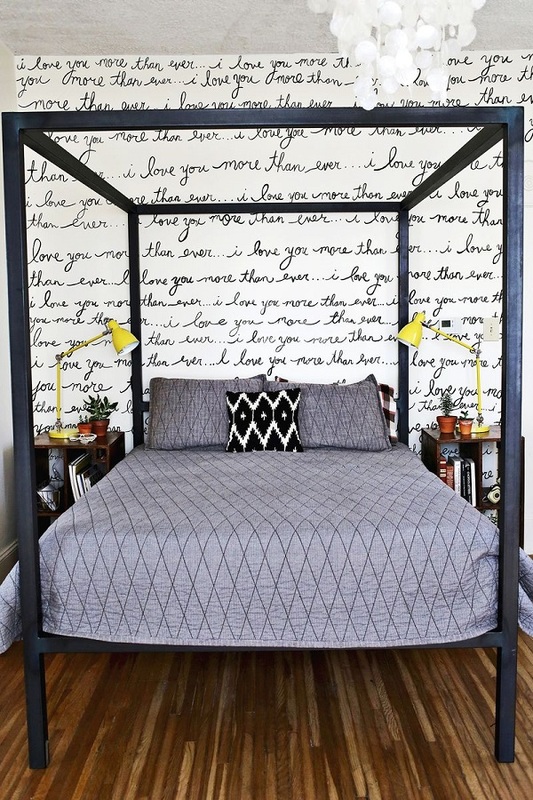 A perfect accent wall idea for this year’s Valentine’s Day! 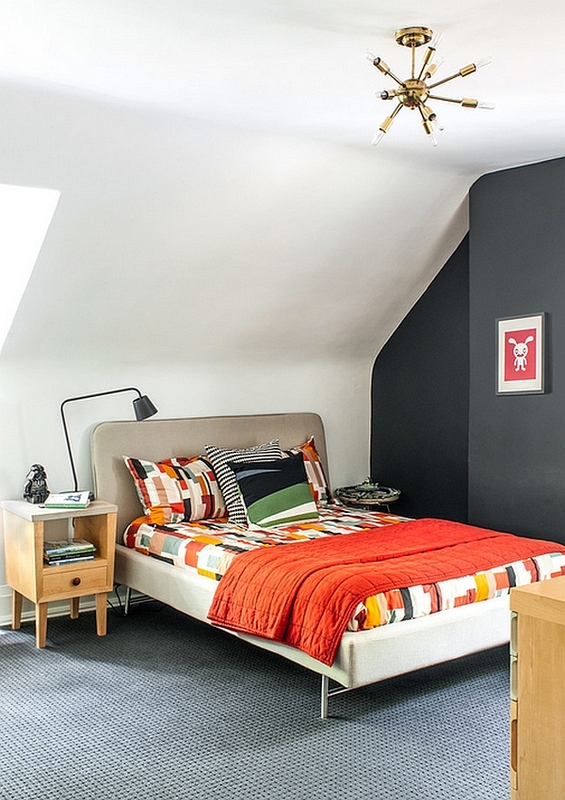 Who knew black could make a great accent wall color? 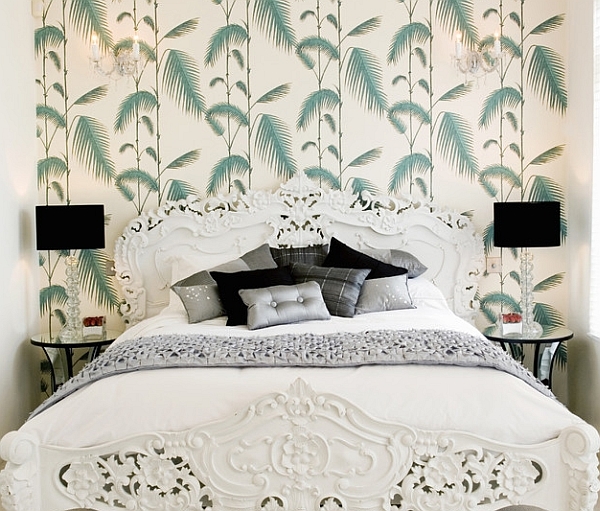 Exquisite layered pattern & textures bring the bedroom alive! 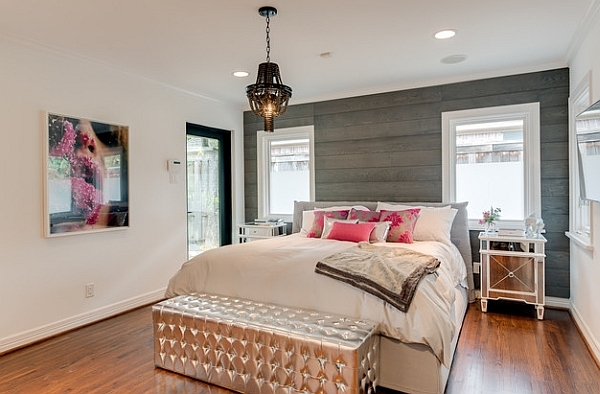 Sparkling and posh bedroom for the modern diva! 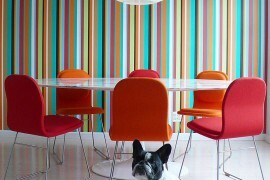 For most of us, the accent wall is the perfect way to add some much-needed color to our interior. 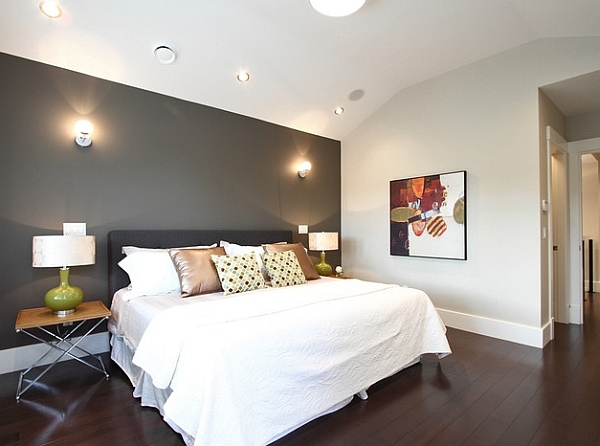 Having a bedroom that is largely neutral with a single accent wall allows you to switch between hot color trends with ease. Couple the wall with a few accent pillows and maybe even matching bed covers and you’re pretty much set. 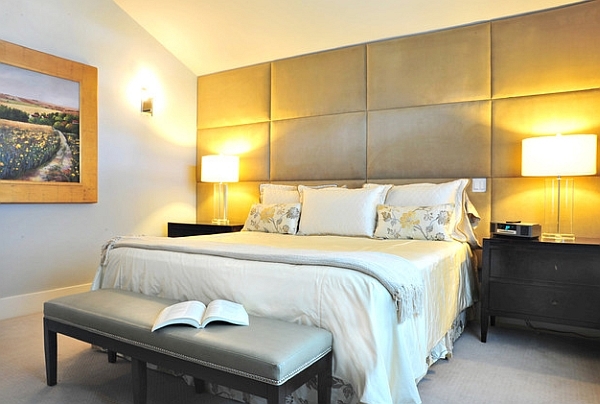 But the advantages of an accent wall become even more apparent while designing a small bedroom. It creates an instant focal point in the compact room without resulting in visual fragmentation of the space. 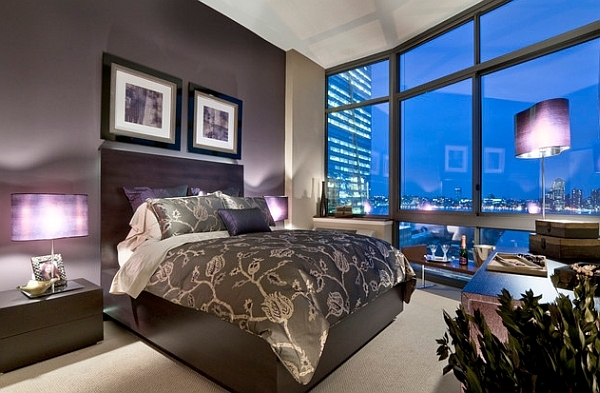 Top color trends for 2014 predict that both grey and purple will continue to dominate the accent wall world. 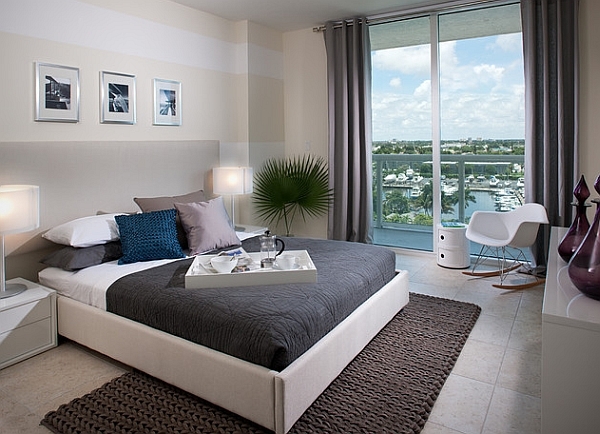 While grey is often associated with a neutral backdrop, modern designers are using warmer and bolder shades of grey as accent hues while the rest of the bedroom is kept predominantly white. 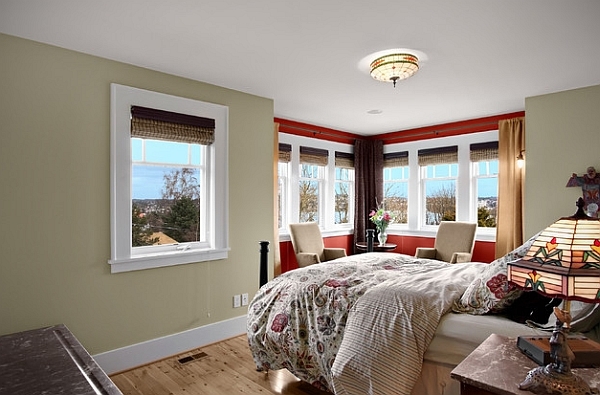 This lends a sense of flair and sophistication to the space that is hard to replicate with other colors. Purple is obviously a perennial favorite, thanks to its opulence and effervescence. 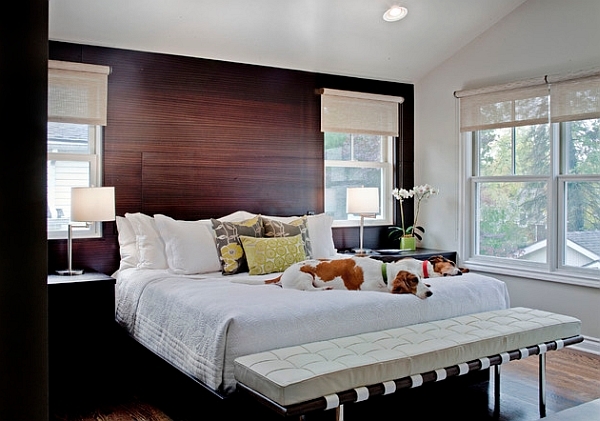 Accent walls need not always be the ones behind the bed! 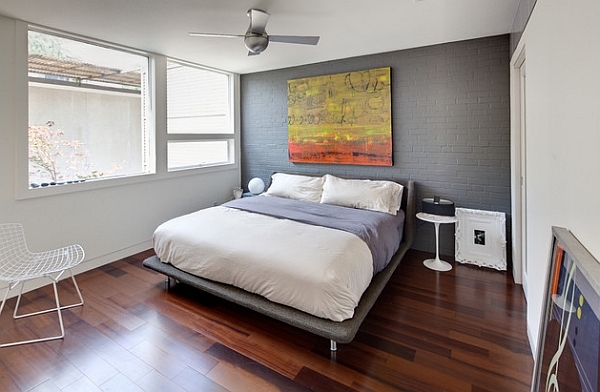 Cool bedroom exudes a mid-century modern vibe! But adding an accent wall is not just about color alone. 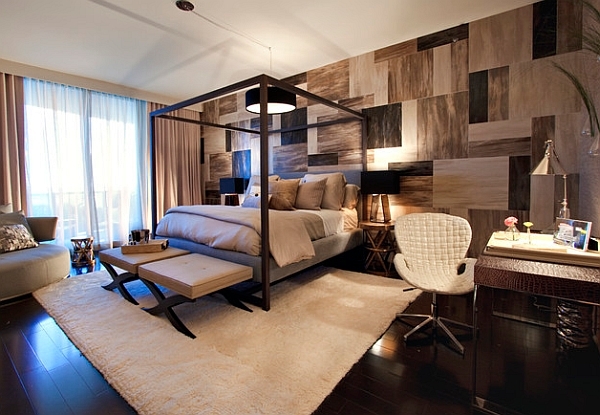 Think of your room as more than a composition of various hues, but also of different textures and shapes. 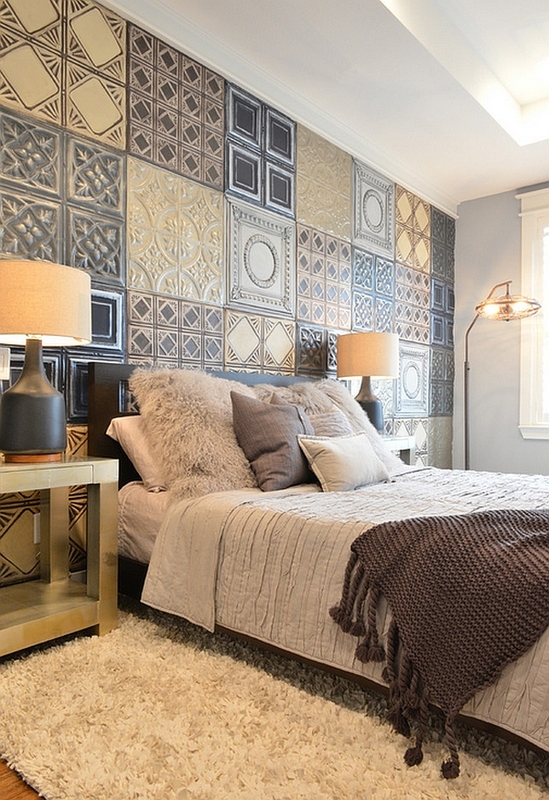 Add some imaginative textural contrast to the room with an accent wall that also comes with 3D art additions. The added dimension brings the space alive, and you will immediately notice the vast difference in the ambiance of the room. For the less adventurous, beautiful paisley motifs and exposed brick walls present some elegant and less mundane alternatives. 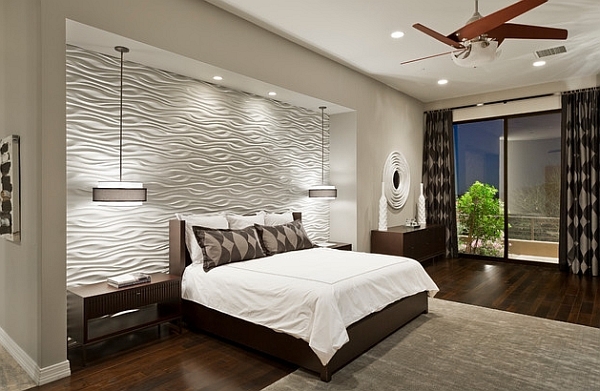 Since it is the bedroom we are talking about, think of accent wall ideas that are unique to this particular part of the house. 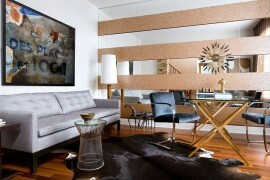 A fully tufted wall is an exquisite idea that oozes class, comfort and luxury that promises to pamper your senses. It can double as a giant headboard, and if you are planning to usher in a chic, Hollywood Regency style, then this is surely the ideal option. 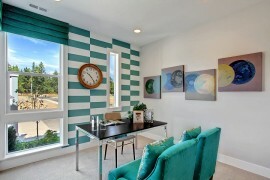 So, you want to add an interesting accent wall but are not very sure about opening that can of paint? 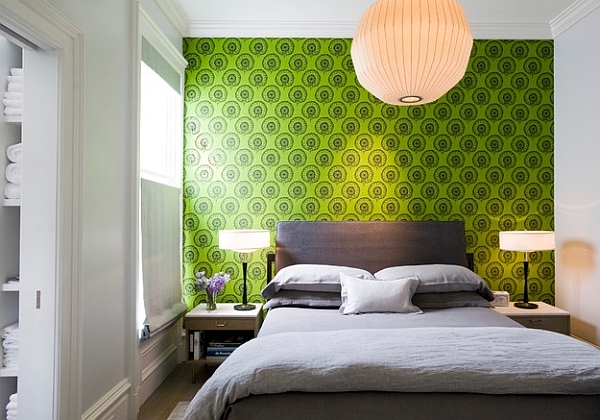 Then it is time to turn your focus toward wallpaper. 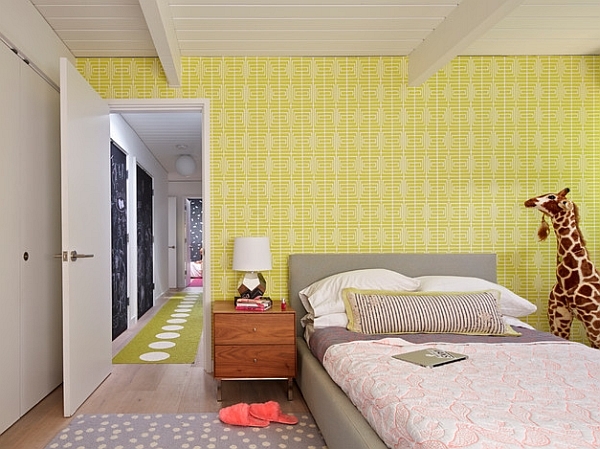 Wallpaper brings the best of both worlds together as you get to add both colors and patterns with relative ease. With most wallpapers today, putting them on or removing them once you wish to switch to a new, bolder print is not hard at all. From sweeping floral patterns to intricate and complex designs; wallpapers can be used to usher in any new motif of your liking. It is also a pretty inexpensive and affordable alternative compared to other makeover options. 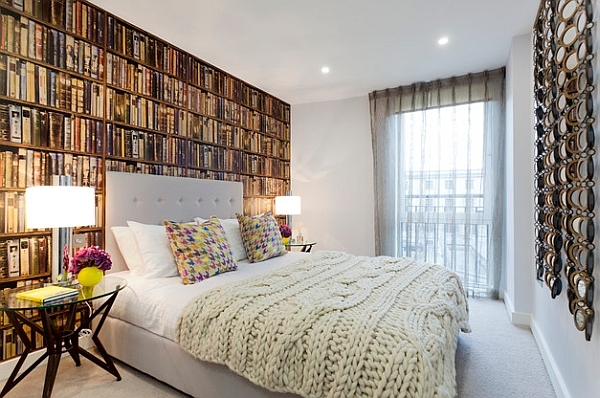 The library wallpaper sure adds an erudite look to the bedroom! 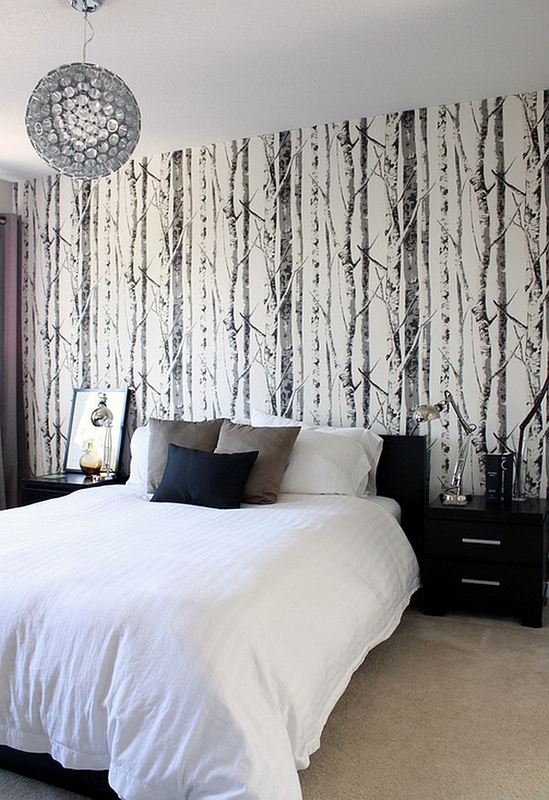 The accent wallpaper you pick can be even used to accentuate any intricate patterns and designs that you have used around the bedroom. Once again, throw pillows and duvets with similar print will lend further beauty to the room and should also give it a far more organized look. 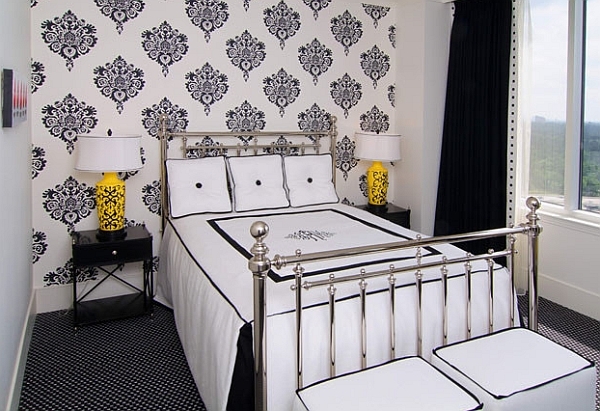 But when you are choosing wallpaper laced with complex and bold patterns, make sure that the rest of the room is as neutral and uncomplicated in its design as possible. 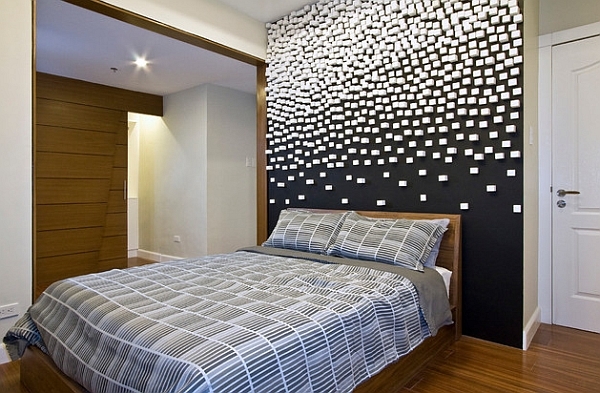 Otherwise, the room could seem far too cluttered and overwhelming. 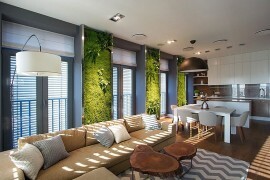 Accent wall idea for those who love their greens! 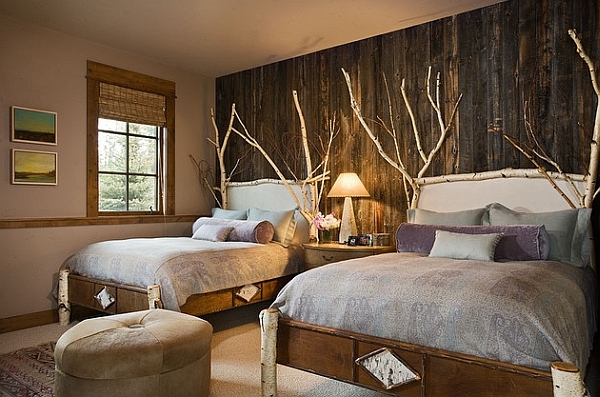 With winter here, wood is one of our favorites, as it brings snug warmth to any interior it adorns. 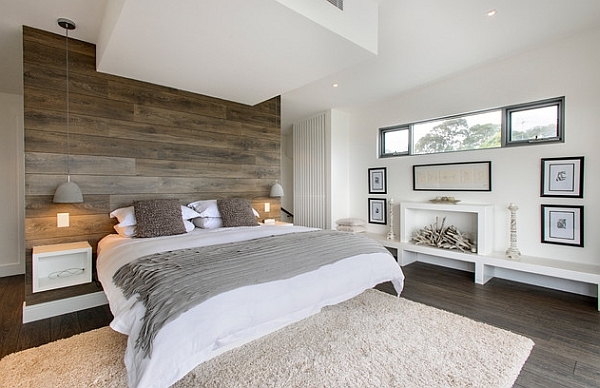 Your bedroom accent wall is no exception, as a gorgeous wooden surface has its own undeniable charm! A wooden accent wall takes a bit more work than a simple paint job, but the result is well worth the extra time and effort. 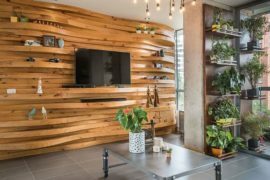 If your contemporary or minimalist home is dominated by concrete, glass and stone, then an accent wall with wooden paneling is arguably the best choice. 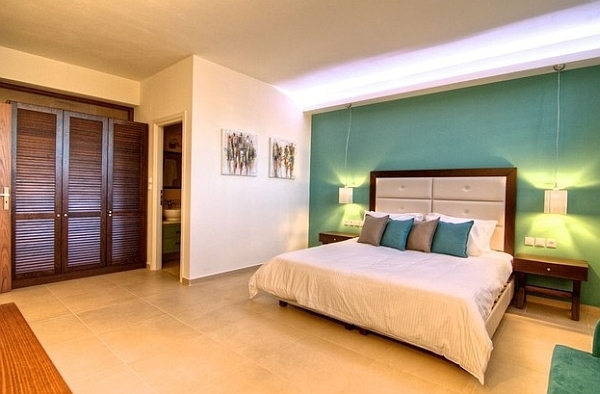 It lends softness to the bedroom and makes it a far more inviting setting. 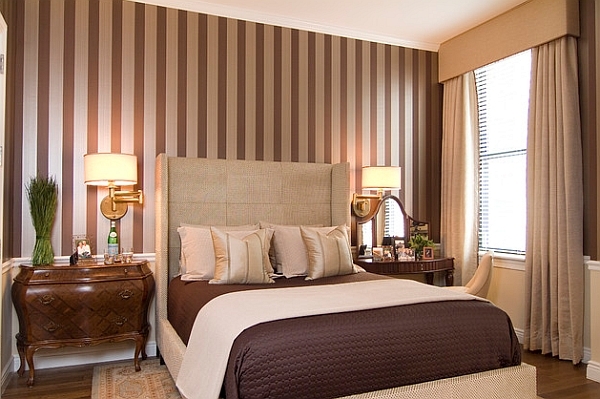 Stripes have a truly amazing quality of turning even the most ungainly space into one that exudes sheer brilliance! Stripes define a room, give it order and can often be used to visually trick our brains into believing that a room is bigger than it is in reality. 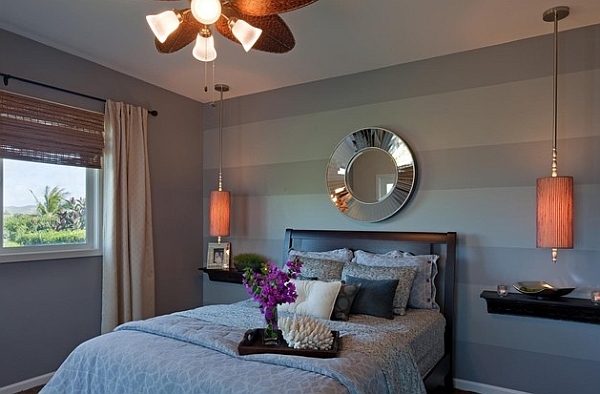 Using stripes for the bedroom accent wall often involves combining a darker shade of the color used for the other three walls with a lighter shade. This is a look that you simply cannot go wrong with, and often the results will tempt you to adopt the stripes in the living and dining rooms as well. 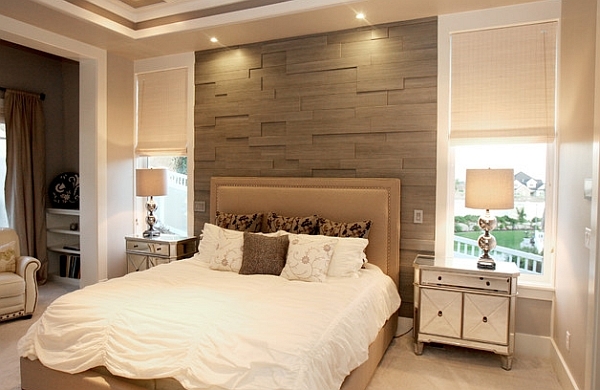 Adding an accent wall to the bedroom is not all that hard. But try to think beyond just color and you will open up a whole new world of possibilities. 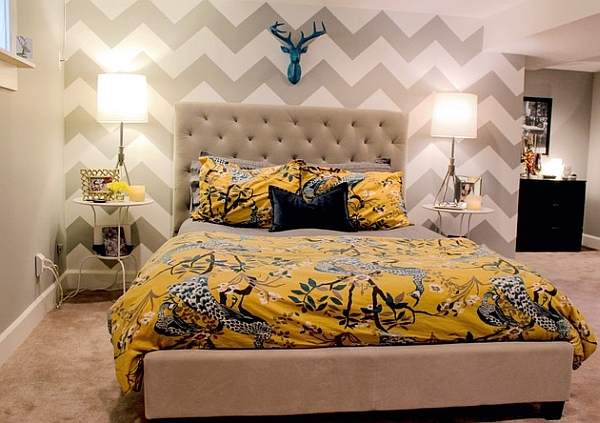 So, what is your bedroom accent wall style?